Students in grades 9, 10 and 11 will complete course selection online using the website www.careercruising.com. Students must then print off their course selection sheets directly from their career cruising account and submit the parent signed course selection sheet to Ms. Hann or Mr. Mitz in the guidance office ASAP. This event is a great opportunity to learn about King’s programs, campus life, clubs, societies, athletics programs, and living in Halifax. Grade 12 students who attend the event are entitled to a free application to King’s in the month of February. Students can learn more or RSVP Online. It’s finally here! 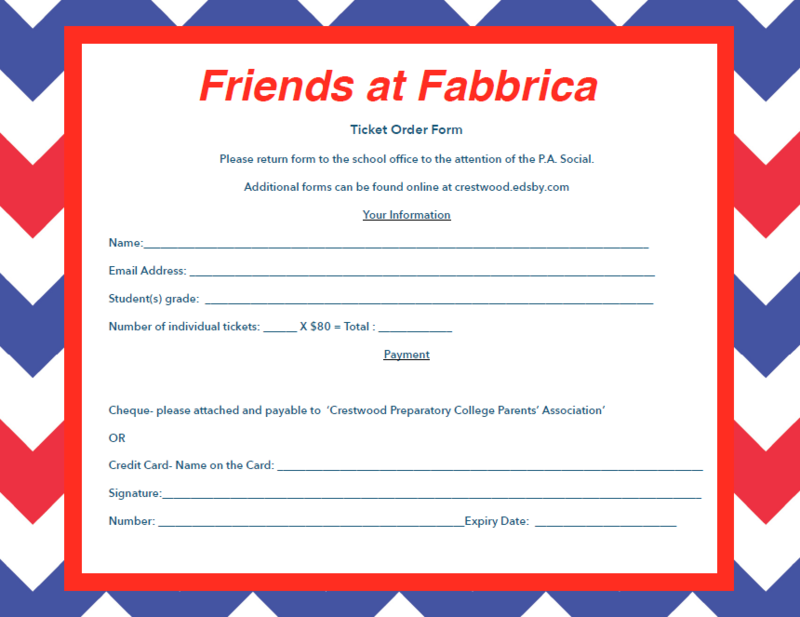 Next Thursday October 29th is our Parent Social at Fabbrica! Come on out–solo, with a friend, or with a spouse, and meet some new parents and teachers. There will be exciting raffle prizes, such as a weekend at Blue Mountain or a Mark Giordano signed Calgary Flames Hockey Jersey. Start time is 7pm, and we already checked, there is NO baseball game scheduled that night! Mr. Scott Masters was presented the Jewish War Veterans International “Flames of Memory” Memorial Award from Martin Maxwell for his work on the Crestwood Oral History Project. Lower School Director at 416-444-5858.
please contact Nanci Steinberg 416.391.1441 (Ext. 21). Congratulations to the entire Crestwood population. Last year Crestwood raised money for “Get Loud!”. In fact we raised more money than any other school in the GTA. Special thanks go out to Anna W. for making this all happen. As a special thank you we received enough Kernels popcorn for the entire school! Keep it up Crestwood! Posted In: Charity, Crestwood News, Get Loud! Terry Fox Day is fast approaching and we will be participating on Monday, Sept. 24th. Pledge sheetswere given to all students this week in their homerooms. Students may gatherpledges by using the sheets or going online at www.terryfox.org and searching forCrestwood (online info is outlined on the pledge sheets as well). Cash or checkis accepted and all donations with pledge forms can be turned in by ThursdaySept 27. Please note that all checks should be made out to The Terry FoxFoundation. To date Crestwood has raised over $104,000 in support of theTerry Fox Foundation for cancer research, thank you for your continued supportof this great cause. From Sept 12-14 the Grade 7’s at Crestwood PreparatoryCollege participated in their first adventure as a combined grade when they travelled to Spirit Point Wilderness Camp in Trout Creek, Ontario. The students immersed themselves in new lifeskills and refreshed some old ones while making new friendships and continuingold ones. From raft building to firestarting and shelter building, the staff at Spirit Point had the Grade 7’sconstantly busy. On behalf of CrestwoodPreparatory College, the Grade 7’s and Mrs. Winograd, we’d like to thank theFrench family and their staff at Spirit Point Wilderness Camp for an amazingfew days. Join us for a welcome back coffee at 9:30am in the cafeteria and a BBQ for all grades at 11am. We are Looking forward to seeing you all on Tuesday. Have a great long weekend! Congratulations to our 2012 Valedictorians, Jarryd and Jonah. Congratulations to all of our 2012 Graduates! All of the groups, as they say, took home a lot of “hardware” for their accomplishments. We are all very proud of them. Our high schoolgrads, in particular, have received admission into prestigious universities andprograms. The number of scholarships announced was testimony to all the hardwork, character and effort that had preceded the accolades bestowed during theceremony. Crestwood is extremely excited for Emanuel accomplishment in being selected to the U15 National Soccer selection to participate in Mexico. He’s currently playing one year up with the 1996 Boys OYSL team. We wish Emmanuel great success with the current selection to the U15 National Team Selection and future success with his ultimate goal of playing professionally. The Crestwood Softball team defeats UCC to capture the U12 Championship at Upper Canada College. The score of the final contest was 10-9 and filled with many peaks and valleys highlighted by a game winning catch by Jacob Wilkinson with the bases loaded and two out in the last inning. Congratulations to all team members and coaches; Erik Usher, Cole Morrison, David McCall, Joseph Eisentraut, Jacob Wilkinson, Matt Benzaquen, Charlie Nogas, Owen Hoogeveen, Thomas Johnston,, Carson Crestohl, Matthew Fabian, Josh Pollack, Macaulay Harling, Josh Mason, Mr. Cooper and Mr. Greenacre. A big congratulations to one of our graduating seniors, Andrew Spanton, for completing his Gold Duke of Edinburgh award. The Duke of Edinburgh Award offers the participant the opportunity to set goals and achieve results in a fun and challenging way. The program is non-competitive. Students who participate in the Duke of Edinburgh Award program share a commitment beyond academic excellence. They share a commitment to personal development and responsibility through service, adventure, skill development and physical well-being. Andrew started his Gold award as soon as he turned 16. He was a member of the rugby and ultimate Frisbee team. He played the trumpet and joined Senior Jazz Band. He volunteered every Tuesday at Cub Pack (boy scouts) for an hour and a half. He organized a 4 day camping trip with a few friends in Algonquin Park and completed his residential project in Australia last summer. Andrew will be invited to a national ceremony of recognition with his certificate awarded to him by a member of the royal family, the Governor General or a noteworthy Canadian. Congratulations Andrew! Congratulations to everyone for the athletic achievements this year! Congratulations to grade 11 student ALEX CHAN for her winning submission to this year’s Spring Poetry Contest, with the theme of “Sweet Nothings.” Her poem The Purple Flower was inspired by a bloom she recently discovered in her backyard garden, and was drawn to the flower’s colouring. Alex will receive a copy of Michael Ondaatje’s collection of poetry, The Cinnamon Peeler, containing an inscription of congratulations from Mr. Pagano. Again, congratulations, Alex! Well done. Crestwood’s Senior Ambassadors premiered their “Flawz” video today in Town Hall, a months-long project spearheaded by grade 11 student Gabi Sandler, with a focus on inclusion and accepting differences. The video encourages students to declare their flaws as a means of accepting that nobody — no matter what they say — is perfect. Students and teachers alike were involved, showing that no matter your shape, size or colour, you are unique and individual. Enjoy! Exams begin for all Grade 9 -12 students on Wednesday May 30th and for all Grade 7 & 8 students on Thursday May 31st. If you have lost your personal exam schedule a general schedule is available on the website under the documents tab. All morning exams begin at 9:00 am and all afternoon exams begin at 1:00 pm. Exams in Grades 7 – 10 are one and a half hours and in Grades 11 -12 they are two hours. Students entitled to extra time will receive up to an additional 50% extra time following this period. Students are to be in uniform for the examinations and should arrive at least 15 minutes prior to the exam. During the exam period the cafeteria will not be open and students will not have the use of their lockers. BOOK DRIVE!!! Give a book. Be the difference. Please help encourage a young person to read by donating new and gently used books that have inspired you, changed your life, or that you loved reading. Second Chance Scholarship Foundation and The Children’s Breakfast Club are holding a book drive and we are collecting books at Crestwood next week to help them reach their goal of 20,000 books. All books collected will be distributed to the libraries established by Second Chance and The Breakfast Club. Please deposit your book donations in the box provided in the front foyer. BOOK DRIVE!!! Give a book. Be the difference. Second Chance and The Breakfast Club hope to inspire children and youth who have not had the opportunity to develop a passion for reading. Thank you for your support and if you have any questions, please contact Mara Bowman, Grade 9 by emailing marabowman139@gmail.com. On Monday, the entrepreneurs of Ms. Lyons and Ms. Dickinson’s grade 10 Introduction to Business classes, kicked off the week off with Crestwood’s Annual Business Fair. Students displayed their inventions and innovations to the school population over junior and senior lunch. Students had a great time pitching their product to both students and teachers. This April, almost 30 Crestwood students from grade 9 to 12 participated in the Begbie Society’s Canadian History Contest, an annual competition designed to test students’ knowledge of major historical concepts and events, as well as their critical thinking and essay writing abilities. This contest is written by over 1200 students across the country. The results arrived back at Crestwood this week, and it is with great pride that the History Department acknowledges the accomplishments of Zachary Brown (Grade 10) and Justin Memar-Markous (Grade 9). Justin, writing the contest for the first time, scored a 92 out of 100, placing him 53rd in the nation. Zach improved greatly on his 81 from last year, scoring a 94 percent, and earning himself the 35th spot in the nation. Mr. Masters, Mr. Hawkins and the entire social studies department would like to congratulate the boys, and thank all of the Crestwood students who wrote the contest this year. 31 Crestwood students, teachers and alumni ran down Yonge street in the Sporting Life 10k run, in support of Camp Oochigeas. It started off as a cool, rainy day; perfect for a morning jog. Just as we all were approaching the finish line, the sun came out to greet us and cheer us on for a job well done. Crestwood staff and students have been training and fundraising since March for this great run and terrific cause. Camp Oochigeas gives the opportunity for kids with cancer to experience the magic of camp, without any cost to the family, and it is able to do this through volunteers and the fundraising efforts of the community. Crestwood has raised $9,200 for Camp Oochigeas so far, making us the winner of this year’s Sporting Life 10k High School Fundraising Challenge for the second year in a row. Donations are still being accepted, and will be for the rest of the week. To donate click here. Thank you to all the students for their hardwork and dedication. To the staff members involved for your support and for helping us out with training, organizing and chaperoning. To all the parents for helping us shuttle bags to the finish line, cauffeuring kids to training practices and getting them to the run at 7am on Mother’s Day. To administration for your continued support of this incredible cause, and a very special mention to my right hand man, Pat McCluskey. Without you, getting this off the ground and running as smoothly as it did would not have been possible. 1. Attention all grade 11 students. For a very limited time grad sweatshirts and ties for the Class of 2013 will be on sale. Put your orders in now. Take a look and try them on Tuesday at the Bake Sale. 2. Thank you to all the parents who volunteered for our bake sales, they are always a hit, thanks to our incredible bakers. Get your last fix on Tuesday May 15. 3. Please join us for a Volunteer Appreciation Reception May 17 in the cafeteria after dropping your kids off. If time allows, we would love to see you at the Annual General Meeting where you will hear about current programs and initiatives and some of the plans for the next school year, and meet your PA for the next school year. 4. Can we help you in reducing the pile for your “to do lists”? The deadline for the bundles order is extended until May 15. Leave it in our hands and we will get the binders, paper, pens, etc. that your child will need for September. For more information contact Sue Beamish, suebeamish@rogers.com or pick up a form from the office. Members of the senior French classes and YARRD students recently held a Skype session with students in the Congo, a conversation that was held in French. Crestwood students shared some information about themselves and were able to learn a little about life in the Congo. The call was made possible through YARRD’s connection to the NGO Friends of the Congo. We have reached our first goal of $20,000 in savings. Ontario is too small for us. Let’s go for Canada #1. Please join the Crestwood EcoAction Team and help us be Canada #1. Create an account and then choose join a team. Our team name is Crestwood Prep College and our password is brookbanks. Early on Tuesday morning, Crestwood welcomed The Our Town Project to the cafeteria. Grade 9 English students studied Thornton Wilder’s play “Our Town” towards the beginning of the year, and had the opportunity to see the play come to life right here in the school. The play tells the story of the citizens of Grovers Corners, examining life, love and death. Without a single set piece (beyond our simple cafeteria chairs) and no props, the actors brought the small rural town to life, just as Wilder had intended. A brief Q+A period followed the performance and allowed students and teachers to ask questions about the rehearsal process and just why this play is so special. The project allowed Crestwood students to experience the play in a way that allowed its insights to become more poignant, its wisdom more clear and its resonance everlasting. The English department would like to thank this group of young actors for bringing the show to our school, and we look forward to more performances in the future. On May 8th an 9th, Grade 7 students Amanda Lawee and Yona Tugg will be selling kernels nut free popcorn before and after school, and at junior and senior lunch. All the proceeds will be going to The Toronto Humane Society. The bags will come in 7 different flavours including: ketchup, butter salt, air caramel, white cheese, dill pickle, salt and vinegar, and kettle corn. Amanda and Yona hope that by selling enough bags of popcorn, they will to be able to give innocent little animals a caring, loving, and nurturing home. The Guidance Department has been busily meeting with grade 11 students to discuss postsecondary planning and course selections for next year. Appointments will continue into next week, and will provide students with information regarding the university application process and how best to research using tools such as Career Cruising and eInfo (please see links below). Every fall, Crestwood hosts a number of universities from all over North America. Students are encouraged to research programs of interest during the summer to better prepare themselves for their return in September. As a note, the Ontario Universities’ Fair will run at the Metro Convention Centre from 10:00am-5:00pm from September 28th through the 30th. Save the date! This is an invaluable experience for parents and students alike, as universities will provide resources in research and will be available for one-on-one conversations. • Career Cruising: Log in using the school ID (Crestwoodprep) and password (Careers) by visiting http://www.careercruising.com. This resource provides information on schools all across North America, and is a great way to navigate career options. • eInfo: This website provides a comprehensive list of every program at Ontario universities — http://www.electronicinfo.ca. If you have any questions about postsecondary planning, please do not hesitate to contact any of the guidance staff. We look forward to hearing from you! The Spring Concert and Art Show is coming to Crestwood! The event takes place in the gymnasium on Thursday, May 10, at 7:00 pm and involves all the music and art students at the school. We always look forward to an entertaining evening.